“I do feel like no one knows what student government is doing or what it is. I feel like student government is really only known for having free blue books,” Jazmin Mejia said. Mejia is a candidate for president in the upcoming SGA elections of the 90th administration. An outline of who she is and who the other candidates are is available in a resource from The Signal – but for a deeper look into her platform and goals as president, read on. On the first statement, Mejia knows SGA does much more than provide blue books and wants to make these actions and initiatives more open to students in her transparency platform. Right now, students who want to reach SGA typically would need to go to a meeting or speak to a senator they just so happen to know. Mejia wants to change this with more on-campus SGA hosted events – on Atlanta and Perimeter campuses. Getting students to show up to events is often a battle in itself and Mejia has a plan for better marketing for SGA – something she learned as a Spotlight member. She says when comparing the two organizations flyers, SGA’s advertising can come across as “bland” and “boring,” which she knows doesn’t attract students. She wants to change some of the marketing and include incentives to come to events, including free food; something she experimented with during the Human Trafficking panel, where she had the idea to hold the food until after the first portion of the panel and then give it out to prevent students who dine and dash. Mejia is also focused on more inter-organizational collaboration to help students feel welcome. She believes that if collaboration increase, especially culture based organizations, students will have the opportunity to meet different students and expand their involvement and connections on campus. Mejia’s last platform is focused on financial literacy. In her experience, she has seen students who accept loans without looking into the repercussions first or students who don’t know how to do their taxes – despite online websites like TurboTax that walk anyone through the process step by step. She hopes to provide students a space to receive this information, through workshops that feature not only other students but professionals and experts. Mejia knows what kind of president she wants to be and when trying to describe herself, Mejia doesn’t like the word “feisty” and thinks “go-getter” is a little aggressive. Mejia grew up in a small town where she was one of the few minorities in her high school. “I came to Georgia State for the exact same reason that I left my hometown, because I wanted to dive into more culture,” she said. Because of Georgia State’s diversity, Mejia has had the chance to expand her horizons of her understanding of others, being culturally Latina but American raised. 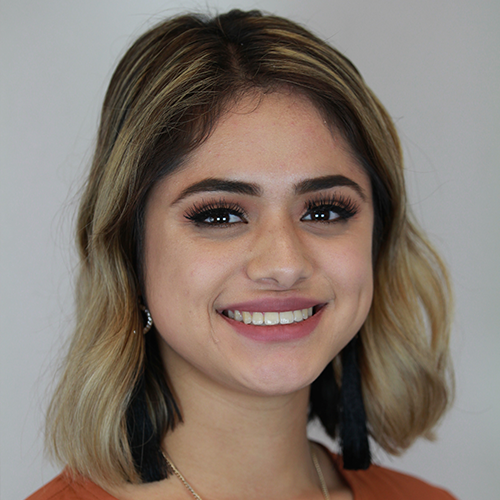 Mejia thinks her campus involvement has been self-less and student focused – including the spa and valentine’s plaza events which were focused on self love. “Last semester I held Orgullo Hispano which showcased Latino culture to let the Latino community feel appreciated by having an event that they didn’t host,” she said. Mejia thinks that she deserves this position because she understands the students. Mejia says she definitely has a backup plan for if she doesn’t win the election because she’s “always thinking ahead.” No matter what the election results are, she plans on staying involved in Spotlight, Phi Alpha Delta and – yes – SGA too. Since she’s approaching her senior year, she won’t be running for president again, but says you can expect to see her in the senate.